One day, a rescue dog named Aragon and his mom Iro went for a walk in the mountains near their hometown of Immitos, Greece. As they were walking, Aragon suddenly stopped and sniffed at a suspicious looking box. 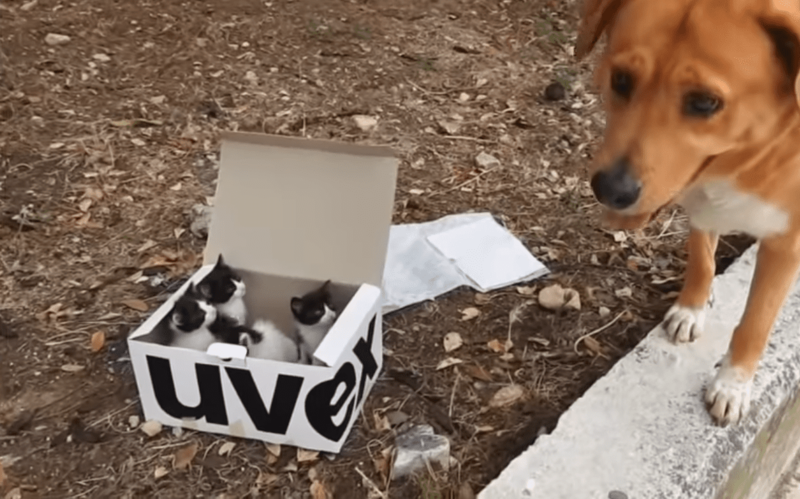 Iro opened it, and she was shocked to see four tiny kittens staring up at her. 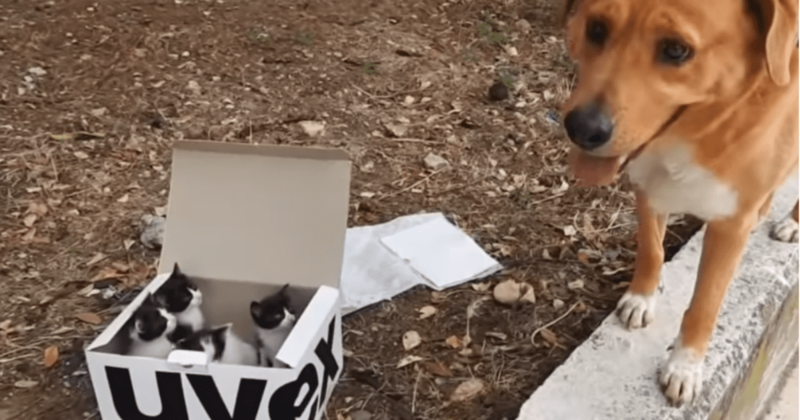 The kittens had clearly been abandoned, and they needed someone to look after them. Aragon’s mom is a volunteer with animal rescue organization SCARS, and she’s fostered lots of cats and dogs through the organization. 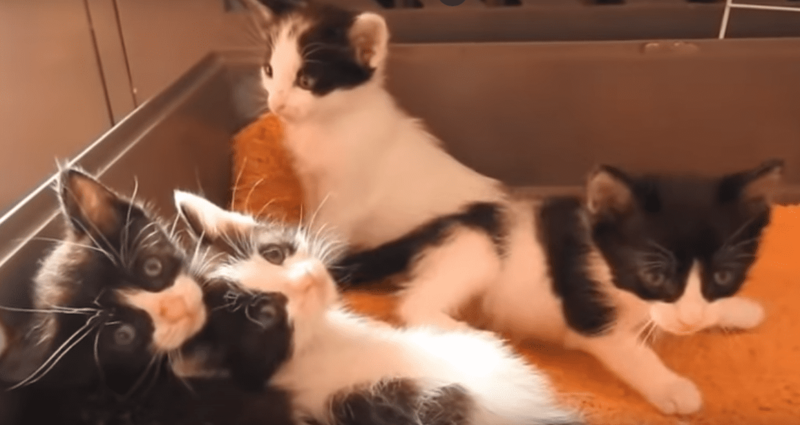 Since she had the experience and skills, she decided she would foster the four little kittens. Iro brought the kittens home, and Aragon immediately gravitated to the box. Without any prompting from Iro, he began looking after the kittens. Aragon spent most of his time laying next to the kittens, keeping an eye on them. 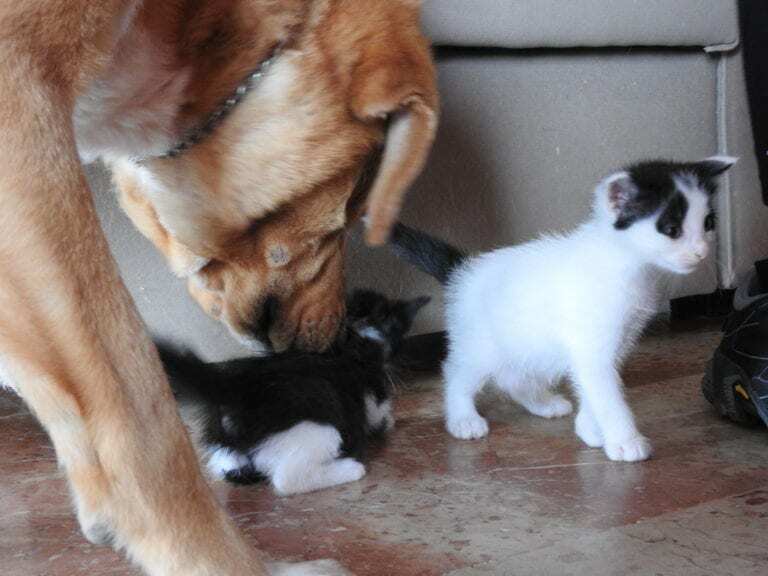 He would also frequently sniff the kittens to make sure everything was alright. The kittens loved their new foster dad! 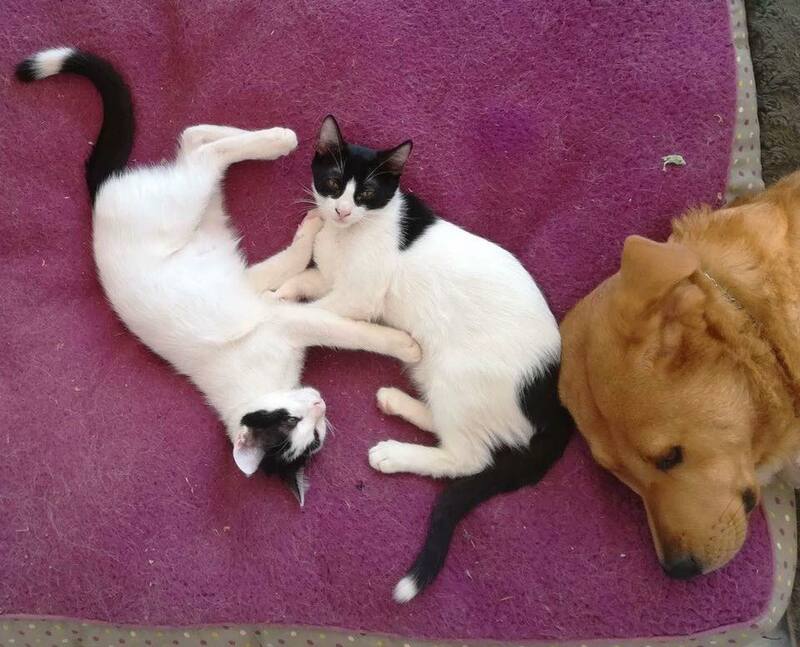 Once the kittens were big enough, Iro started looking for forever homes for them. Since she’s a professional hiker, Iro named the kittens after famous Himalayan summits: Macalou, Manaslou, Lotse, and Cho. Cats with black fur are always hardest to get adopted out. This is even true for cats with black-and-white fur, like the four kittens. Even though a video of Aragon and the kittens had gone viral, Iro still had trouble finding people who would take in the kittens. 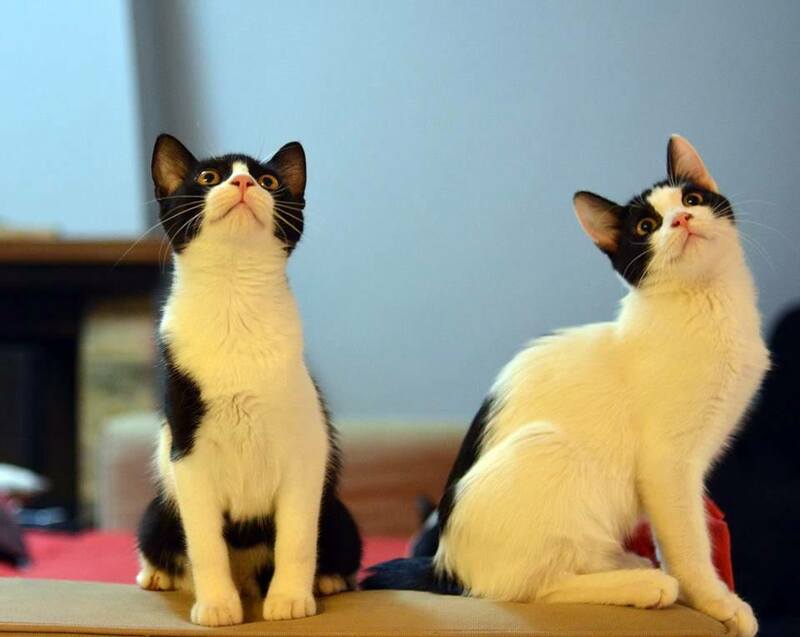 After seven months, she had only found a home for one cat, Lotse. Still, the kittens didn’t mind. It gave them more time with their foster dad! It took a few more months, but the cats eventually all found homes. The cats are all growing up in great places with owners who love them. Macalou, Manaslou, Lotse, and Cho aren’t the only kittens Aragon has fostered. He was also a great foster dad to an adorable cat named Simone! SCARS shared a cute video of Aragon and Simone. It’s easy to see how much Aragon cares about cute little Simone. “Sometimes [Simone] thinks she’s a dog too, sometimes she tries to make Aragon act like a cat. Simone was rescued from the streets of Athens – Greece. She has such a friendly character that every day she would acompany Aragon and his owner to their morning walk. One day, as they were coming back, she just entered the house with them, and stayed,” SCARS wrote on YouTube. Aragon is a sweet dog who loves looking after animals in need! If you want to learn more about Aragon and the kittens, check out the video below.